TREND-UK has contributed to an updated set of clinical recommendations designed to improve the care of people with diabetes at the end of their life. 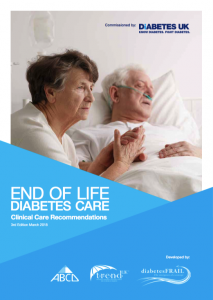 The third edition of the ‘End of Life Diabetes Care: Clinical Care Recommendations’ has been published to reflect latest evidence. It has been commissioned by Diabetes UK and developed by ABCD and Diabetes Frail alongside TREND-UK. The document aims to summarise a consistent but high-quality approach towards end of life care for people with diabetes by providing a series of clinical care recommendations. Professor Alan Sinclair, one of the authors, said: “This updated guidance summarises the major clinical problems that individuals with diabetes at the end of life experience and how these are best managed. Professor Jonathan Valabhji, National Clinical Director for Diabetes and Obesity for NHS England, added: “The care of people dying with diabetes demands a multidisciplinary approach with healthcare professionals coming together with the person with diabetes, their family and their carers to formulate and deliver a plan for management through all the phases of dying.